Leonard Cohen has died. Perhaps he should have received a Nobel Prize, or shared one with Bob Dylan, because he certainly produced some of the most memorable descriptions of the human condition to be found anywhere. I first heard it on ABC Radio in Australia a scant twelve years ago. 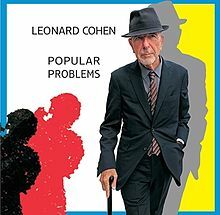 It seems stunning that someone who lived through the 60s, participated in anti-war demonstrations, and even helped to found a new political party (the Australia Party, if you want to know) could never have encountered Leonard Cohen’s music, or his poems. For it was as a poet that he began, and only turned to music later. I am now 74, and still a kid with a dream – a dream to help make the world a better, fairer place (although through science rather than music). That was Cohen’s dream, I am sure, as he leaped lightly to his feet from a cross-legged sitting position during his concerts. The dream was tinged with blackness – but that’s how it goes.